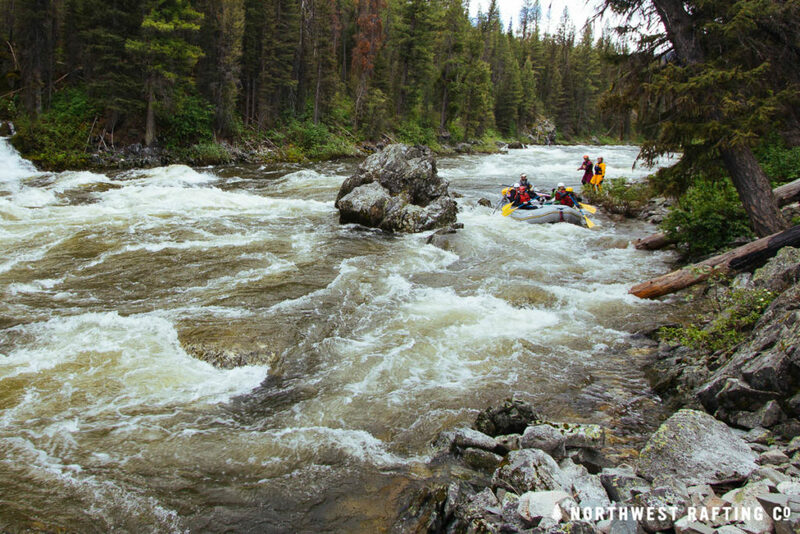 In a post for Northwest Rafting co. written by Zachary Collier, high water on the Middle Fork of the Salmon begins at 5 feet when the river is quite continuous, the water is cold, and recovery from a flip or swim can be difficult. •	Is the river rising? •	Could the weather forecast cause the river to rise further? •	Is there wood floating in the river? If you answer “yes” to any of these questions the river is unpredictable and you need to rethink whether it is safe to launch your trip. If there are large logs floating in the river you should not launch. If a trip is in progress you need to wait until the river drops and logs stop floating down the river. Mile 0.9: Murph’s Hole is a huge almost river-wide hole that will flip most boats that go into it. Most people pull to the left bank to avoid it. You should hike down the from Boundary Creek and scout the rapid and it’s entrance before you launch. A flip and/or swim here would be really hard to recover from. Mile 4.7: Hell’s Half Mile is a long rapid and one of the most dangerous due of the possibility of a very long swim. There is a big diagonal on the left at the bottom that will flip most boats. If you have a flip or swim here it will be nearly impossible to recover before Velvet Falls. Mile 5.1: Catch the left side eddy after Hell’s Half Mile to scout Velvet Falls. Mile 5.3: At high water Velvet Falls forms a huge almost river wide hole. Above 6 feet it’s possible to go left of the large rock and miss the hole completely. You should scout this one and set downstream safety. Mile 82.2: There are some huge holes at Redside Rapid that can be missed by taking a sneak line on the right. Mile 93.2: Devil’s Tooth Rapid has a huge hole in the center at high water that can be missed by sneaking down the left. Mile 98: Cramer Creek Rapid was formed in 2002 and is still changing. It should be scouted on the right side. Photos courtesy Northwest Rafting CO.